Reference Picker BETA is a downloadable software tool that enables you to easily extract the US, foreign and other references from any specifications (.doc format). 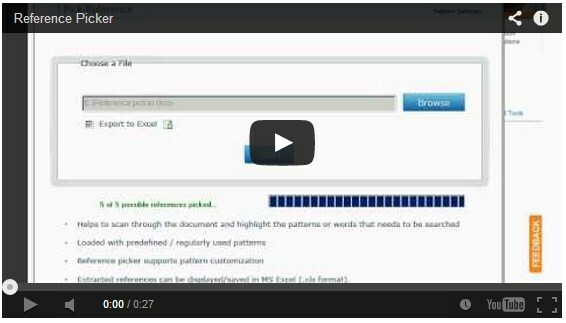 The extracted references are displayed/saved in MS Excel (.xls format) with links to the corresponding public sites (when available) and are also concurrently highlighted in the selected document. 1. Click Download followed by the Run button to start installation. Startup Menu All Programs MaxVal Reference Picker. Click "Browse" button to select the specification from which the references are to be extracted. Check the Export to Excel checkbox, if you would like to display the extracted references in an Excel format (optional). 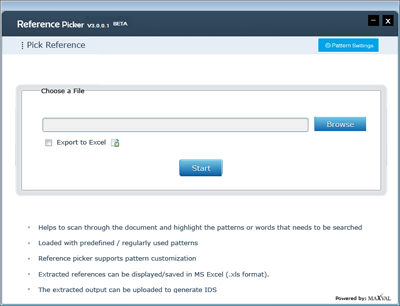 Click "Pick References" button and wait for the tool to process and open the document.